The Each Way King is a daily email advisory service offering mainly E/W bets on UK horse racing 7 days a week. Promoted by the reputable Betting Gods outlet, this service proposes to send out around 60 to 70 selections per month via email each morning well in time to get the bets on. We are advised that a betting bank of 100pts is set aside to follow the service whose selections have variable stakes of 0.5pts E/W to 2pts E/W for their selections. In the 20 weeks since launch, I've been keeping an eye on The Each Way King (E/W King for short) and in that time they have advised 270 bets for total stakes of 487.3pts. So we're looking at around 1.8pts per bet. 81 of the 270 have won, producing profits of 172.46pts at an ROI of 35.4% from a strike rate of 30%. A subscription to E/W King is currently priced at a reasonable £24.95 per month, but there are substantial discounts for those signing up for longer periods. A quarterly subscription is offered at £59.95, saving you approx. 20% over the quarter, whilst the best value comes from the lifetime subscription at a one-off £149.95 ( just 6 x monthly fee!). Geegeez readers can take 14 days for free via this link and it's worth noting that as all payments are handled via Clickbank, a full 60-day, no-quibble, money-back guarantee is offered. David Sutton will now follow the fortunes of E/W King for the next 60 betting days, using a £5.00 per point stake to even the bets out to around our nominal £10 stake and we'll report back on a daily basis. The 60-day trial has now concluded and it appeared more to be The Each Way Prince than The Each Way King. Despite not being the Crown Jewels, we did get a small tiara instead. The trial returned a profit, a net profit too and, a profit shouldn't be sniffed at, albeit just a shade better than 1 point at the £5 per point stakes. There was real hope The Each Way KIng would provide a rich harvest at the midway stage but the results tailed off alarmingly and were saved only by a late recovery. This is probably understandable given the nature of the bets and the big odds end of the market this service deals in. 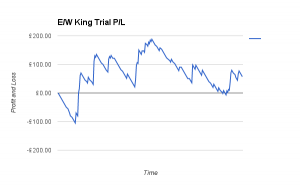 If you understand this and can accept it, the Each Way King service is something for you to consider in your portfolio. Ultimately, what did for this service was the lack of winners although, as we'll see The Each Way King did meet expectations on that front. Let's break the selections and results down a little further. So, the winners did meet expectation if one considers the prices of each selection but, only just. This gives a bit of value but didn't turn a profit and the Archie indicates it could be more down to luck. The place bets fair much better and the figures look quite good. It suggests that the selections are sound as each way bets and the horse gives a good run for your money in the place market. The trial didn't hit the jackpot on the each way doubles and let's face it, this would have made a tremendous difference the the bottom line. Considered together, the win and place doubles eked out a very small profit (£0.55) but not a single win double came in. 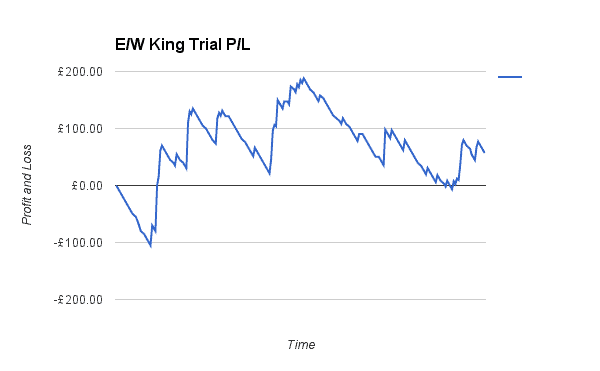 In truth, catching a 'big' win on these doubles during a 60 day trial would have skewed the results because the sample size is so small however, that's the modus operandi for the E/W King. In summary, E/W King provides solid each way selections and the foundations are good for the service. It's professionally run and the emails arrive in good time (some the night before, some the morning of the race) without a hitch or complaint. The risk is in waiting for the big winner to go in and hoping that the big double follows suit. Consider this in your selection of this service because it has a place in a balanced portfolio but if you're risk-averse, take a look at more consistent services (Stat of the Day? ).